Cubs outfield prospect Billy McKinney knows baseball is a team game. The individual accolades and standout performances are nice, but he recognizes the greater goal is to do anything he can to help his club succeed. That mentality was evident Monday evening. 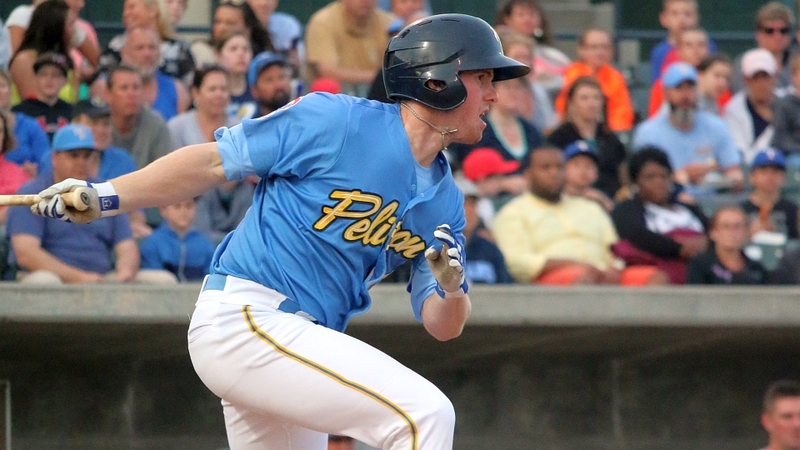 McKinney went 2-for-4 with a triple, three RBIs, a walk and a run scored in the Class A Advanced Myrtle Beach Pelicans' 14-6 win over the host Lynchburg Hillcats. The No. 8 Cubs prospect walked in the first inning and beat out an infield single to second base that plated a run in the third. He collected another RBI on a fourth-inning ground ball to second, was hit by a pitch in the fifth, grounded out to first in the eighth and clubbed an RBI triple to center field to cap a five-run ninth. "There's not too much to say, I found some holes in the field and got some hits," said the 2013 first-rounder, who raised his average to .301. "I was just trying to be calm and confident, that's all I try to do. My teammates helped me out by getting on base. It's nice, but the big thing is helping the team out any way I can." McKinney started the season batting 2-for-13 with a pair of singles through his first four games before recording multi-hit appearances in five of his next eight contests. After just one homer in his first 17 appearances, the outfielder slugged two balls out of the ballpark Sunday afternoon and followed that up with a season-high three-RBI performance Monday. "I didn't find any holes," McKinney said of his first few games in the Carolina League this year. "I'm just hitting it right, I guess. Now I hope to have a good rest of the season. You have to have a good at-bat every at-bat. I try to see the ball well every at-bat and just see how it goes." In his third year of pro ball, McKinney is playing for his third different Class A Advanced team. He started 2014 with Stockton in the California League and then suited up with Daytona in the Florida State League after he was part of the package sent to Chicago when the Cubs moved Jeff Samardzija to Oakland last June. The Cubs changed their player development contract after the 2014 season, partnering with Myrtle Beach. Daytona rebranded as the Tortugas and shifted affiliation to Cincinnati and the Rangers took control of High Desert. The 20-year-old said he is not focused on improving any one specific part of his game this year with the Pelicans and believes instead that he needs to keep a well-rounded approach to help him and his team in any situation. "Learning how to help the team win, that is important to me," the Texas native said. "Whatever helps me. Every aspect of my game. I would say every aspect. Do something that is positive for the team. I'm trying to be confident and do my best." Myrtle Beach designated hitter Kevin Brown went 3-for-5 with a double and a run, first baseman Jacob Rogers was 3-for-5 with a homer and four RBIs and left fielder Wes Darvill reached base three times, plated three runs and scored twice in the win. Pelicans starter Jen-Ho Tseng allowed three runs on six hits and two walks over three innings and did not factor in the decision. Lynchburg's Clayton Cook (1-1) surrendered five runs -- one earned -- on six hits over 3 1/3 innings. He walked five batters and struck out one.